The founders of the Oriense startup have created a "navigator" for the visually impaired and the blind, helping them feel confident both inside and outside with the help of an audio guide. This tool will be able to replace ultrasonic canes and other localizers. Developers are planning on selling their navigator not only on Russia’s domestic market, but also in Western Europe and in America. 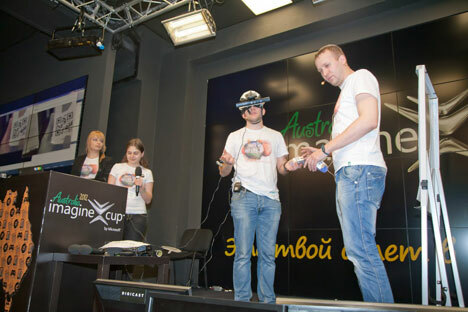 In May 2012, the company presented its latest development at the Business of Innovative Technology contest and won second place. It was during this same contest that they met the partners of the startup accelerator iDeal Machine. Having modified the device a little bit, they received $20,000 from the RSV Venture Partners venture capital fund. Using this money, the company later created a fully equipped prototype that was smaller and lighter, and tested the prototype in St. Petersburg's Center of Medical and Social Rehabilitation for the Visually Impaired. “The device used to be rather bulky—it completely covered the patient's chest—but the navigation worked properly. The blind patient moved around the room with the help of verbal assistance translated into their ears through earphones,” says one of the center's coaches, Alexander Sadchikov. In the new version of the device, creators decided to use a new, smaller Israelian PrimeSense sensor, instead of Kinect. The latest version of Oriense consists of side cameras, a microcomputer, and a 3-D camera that records objects in front of the patient. The system analyzes the information, choosing the best way to avoid an obstacle and transferring this information into words and into the wireless headset. This is enough for a person to feel free and confident while moving around a room, says Kitayev. In August, Oriense received the highest index of investment attractiveness (AAA) in the Russian Startup Rating. Currently, the company is in talks with private investors and venture capital funds, which are said to be ready to invest $4 million in the startup. This money will be enough to create a device that will be able to work out the color of a traffic light or distinguish a price tag in a supermarket. The expected retail price of this device will be approximately $800. There are plans to sell Oriense through Internet stores for the blind and through distributors that specialize in medical rehabilitation equipment. In the future, Oriense is planning on selling their devices through the b2g segment—for example, through different state companies that offer work to the partially blind and through charities and nongovernmental organizations that are able to guarantee wholesale buying. The company is also planning on moving to European and American markets. In summer 2014, the first pilot lot is set to be released; the expansion into the European market will not begin until 2015. However, Russian biotech investors are not so sure that the startup will be successful on a global level. According to Elena Kasymova, director of strategy and investments at Bioprocess Capital Partners, the majority of Russian venture investors act extremely carefully when it comes to investing in medical devices: There are too many risks, both in terms of technology and in terms of sales. Most likely, the startup will have to distribute the devices through government procurement. Gelena Lifshitz, an expert from Skolkovo, also thinks that the device will not survive without government support. In order to earn this support, however, the device should first prove its effectiveness. First published in Russian in RBC Daily.